Nearly one-third of us will experience an anxiety disorder at some point in our lives. Why do some people overcome their fears while others become incapacitated? The answer might be in our genes. Illustration by Brian Stauffer. Emory University researchers found that an experience linked with a smell can modify the architecture of the nervous systems in later generations. When a frightening stimulus is encountered, the thalamus shoots a message to the amygdala — the primitive part of the brain — even before it informs the parts responsible for higher cognition. 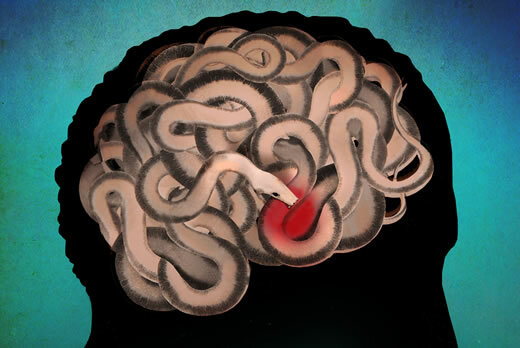 The amygdala then goes into its hard-wired fight-or-flight response, triggering a host of predictable symptoms, including racing heart, heavy breathing, startle response, and sweating. Emory psychiatrist and researcher Kerry Ressler is on the front lines of fear-disorder research. In his lab at Yerkes National Primate Research Center, he studies the molecular and cellular mechanisms of fear learning and extinction in mouse models. At Grady Memorial Hospital, he investigates the psychology, genetics, and biology of PTSD. And through the Grady Trauma Project, he works to draw attention to the problem of inner city intergenerational violence. "If you look at Kerry's work, it can seem like it's all over the place — he's got so many studies going on, and he collaborates with so many other scientists," says Barbara Rothbaum, associate vice chair of clinical research in psychiatry and director of the Trauma and Anxiety Recovery Program at Emory. "But they are all pieces to the same puzzle. All his work, from molecular to clinical to policy, fits together and starts telling a story." A Howard Hughes Medical Institute investigator, Ressler was recently elected to the Institute of Medicine — one of the highest honors in the fields of health and medicine. He was named a member of a new national PTSD consortium led by Draper Laboratory. And he recently appeared on the Charlie Rose show's brain series.